Snake VS. Colors is an amazing arcade game from Crazy Labs by TabTale. You’re a slithery snake in an endless color road, and the colors are out to get you. Slither and slide your way down the color road through deadly color obstacles. 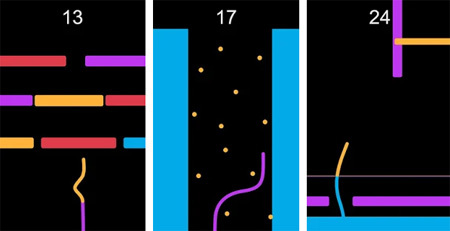 Drag your finger left or right to avoid them in this slithery color game. You can only touch colors that are the same color as you. As you make your way down the color road, colors change sssuper fast, and you need to think like a snake and be quick to keep up. If you get stuck in the game, check out the video walkthrough and gameplay for the game. This entry was posted in Android Games, iOS Games, Mobile Games, Walkthrough and tagged Snake VS. Colors Cheats, Snake VS. Colors Game, Snake VS. Colors Gameplay, Snake VS. Colors Guide, Snake VS. Colors Hints, Snake VS. Colors Review, Snake VS. Colors Solutions, Snake VS. Colors Strategy, Snake VS. Colors Tips, Snake VS. Colors Walkthrough by Marvin. Bookmark the permalink.